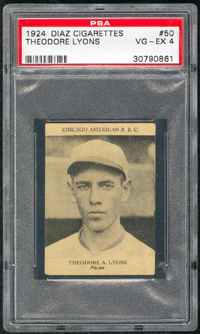 Ted Lyons had the misfortune of pitching for the White Sox during some of the worst years in the history of the franchise. 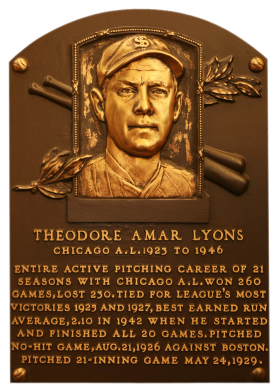 Inducted in 1955, he won 260 games lifetime, with 356 complete games and 27 shutouts. He led the AL in shutouts twice and wins twice. In 1942, he led the AL with a 2.10 ERA. At age 42, he served three years in the Marines during World War II, then returned to baseball for one last season in 1946, going 1-4 despite a 2.32 ERA. He managed the Sox through '48. Comments: From what I can tell, this is the only known copy of Lyons' rookie card. I have not seen another or heard of one. A lot of folks have tried to pry this one away from me - no sale. I love this one. Before I had it slabbed by PSA it still smelled like a fine cigar. Now, that's all sealed away inside the little plastic case. UPDATE: Up until June, 2014 I thought my Lyons rookie was the only copy around. 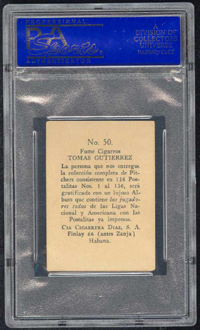 Throughout the month an eBay seller had been listing several '24 Diaz cards and I was hoping the listings wouldn't include another. Well, my wishes didn't last. A nice example popped up and ended with a final bid of $1551.56 on July 4th. 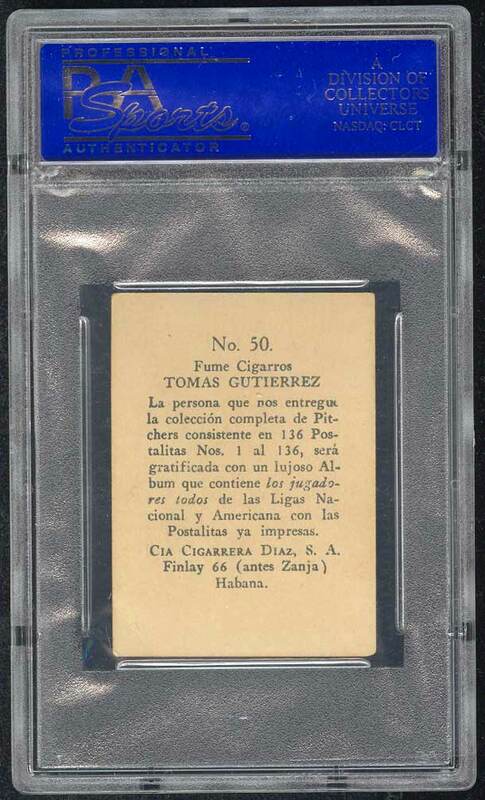 To make things worse, the winning bidder posted the card in a thread on Net54 and another collector posted a picture of their example for comparison - a SGC 30. So, there's atleast three copies out there....oh well.